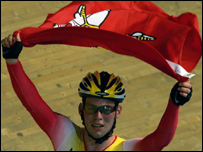 A top Manx cyclist is backing new plans for a velodrome to be built on the Isle of Man. The island's Cycling Association recently submitted a business plan for one to be built at Onchan stadium. Commonwealth Games gold medallist Mark Cavendish, who comes from Laxey, says a velodrome would help boost the standard of cycling on the island. Stadium owners, Onchan Commissioners, will decide in the New Year which organisation to lease the site to. Mark Cavendish won the island's first gold for 20 years when he scooped pole position in the 20km (12.4 mile) scratch race in March during the Commonwealth Games which were held in Melbourne.